Katie is a delightful seven-year-old girl who recently finished speech and language services at the San Jose Scottish Rite Language Disorders Clinic. Katie and her family worked diligently and put a lot of time and commitment into her speech program. Katie was diagnosed with childhood apraxia of speech before coming to the clinic. Another therapist had told her mother there wasn’t much hope for improving Katie’s speech. Apraxia creates a difficulty producing, sequencing and coordinating oral movements. Children with apraxia have a difficult time producing and combining sounds to create words. As a result their speech can be difficult to understand, as was the case for Katie. 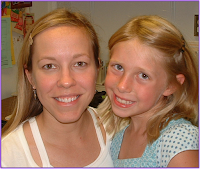 Katie’s mother stated, “It was hard for Katie’s teachers and friends to understand what she was saying. My husband and I could usually understand her but it was so hard for all of us when we couldn’t. She would get frustrated and end up crying.” In other aspects such as language development and academic skills Katie was excelling. However, at her age she was becoming more and more aware that people couldn’t understand her. This was causing frustration at home and school.